Using A Thick Handled Bar Is One Of The Very Best Things You Can Do To Develop Maximum Muscular Size And Strength." 1) What Are Fat Gripz? 2) How Good Are They? They are quite amazing which is why Fat Gripz are now used by members of the US Special Forces, British Marine Commandos, NFL teams, top UFC fighters and champion powerlifters AND why Fat Gripz have been featured by Mens Health Magazine, Men's Fitness magazine, Ironman magazine, Flex magazine, Maximum Fitness magazine, Musclar Development magazine and the New York Times #1 Best Seller, The 4 Hour Body by Tim Ferriss. 3) How Exactly Do They Work? Fat Gripz instantly convert barbells, dumbbells, chin-up bars and exercise machines into THICK BARS. 4) What Are Thick Bars? Thick bars are simply barbells, dumbbells and pull-up bars with a thicker diameter handle. A standard barbell, dumbbell, or chin-up bar typically has a handle with a diameter of about 1 inch. A thick bar will often have a diameter of more like 2.5 inches (some look more like truck axles) and if you've ever used you will know that it feels completely different. 5) What's So Special About Thick Bars? Using a thick bar means MORE MUSCLE AND STRENGTH on your body. Thick bar training produces much bigger strength and muscle gains compared to standard training equipment…. and many people find them much easier on their joints too. Thick Bars are not new. Strongmen, champion powerlifters and pro athletes have been using them for decades. 6) Why Does Using A Thick Bar Have That Effect? Increased muscle activation - thicker handles stimulate much more muscle activation in the hands and forearms and in the upper arms and whole upper body. More muscle activation means much bigger muscle and strength gains. "Unlocking" muscle gains - thick bars make your hands, fingers and forearms so much stronger that your body can finally stop "holding back" the strength and muscle gains in your uppers arms, back and chest. Complete training - thick bar training automatically trains your hands, fingers and forearms at all angles. If you are bench pressing, the thick bar will train your hands and forearms in a completely different way than if you are doing chin ups on a thick bar. Natural movement - thick bars perfectly replicate the natural function of the human hand - lifting heavy, awkward objects. Automatic training - thick bars means you are training your grip the whole time and you don't even need to do any extra exercises. Concentration - thick bars are harder to handle so you need to concentrate a lot harder to lift the weight. Some credit this alone with making them significantly stronger. 7) Should I Use Fat Gripz Or Thick Bars? Thick bars are great but they are very expensive and, therefore, quite rare (a thick bar may cost $300 - $800 and a set of thick-handled dumbbells may cost $10,000 - $25,000). Also, you can't take them to different gyms easily and thick chin-up bars and thick-handled exercise machines are almost non-existent. 8) What Will YOU Get From Using Fat Gripz? More muscle. More strength. Fast. It's as simple as that. Most people who train with Fat Gripz find that their arms size and strength (in particular) increases dramatically and, as a result, their whole upper body grows. You will literally feel them working the very first time you use them. 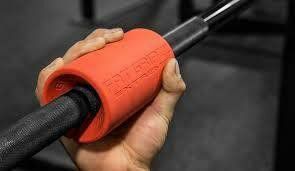 Fat Gripz are super high quality, fully portable and will give you the benefits of a gym full of thick bars (no matter where you train) at a fraction of the cost. 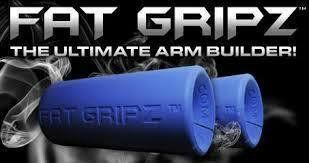 Switching to Fat Gripz might be the single biggest difference you can make to your muscle size and strength today. 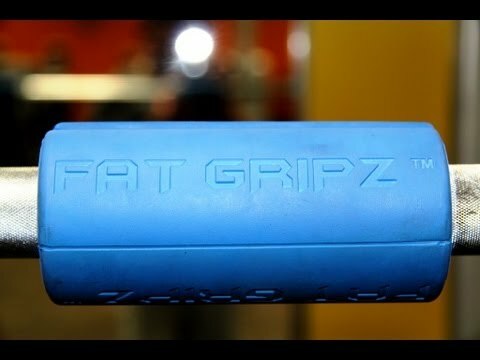 9) What Are Fat Gripz Made Of And How Do I Use Them? Fat Gripz are made from an ultra tough military-grade compound which is a lot like rubber (you might be surprised at the weight and quality of them when you open the box). They have a slit down one side which allows them to be pulled open and slid easily onto the bar and then close tightly around it. They will not wear-out or compress and they are designed to be rock solid on the bar as if they re a part of it. 10) Can I Just Make A Home-made Version? Sure, but the design and manufacture of Fat Gripz are the result of years of extensive testing and refinement by some of the best strength coaches in the world. The design, manufacture and materials used to make Fat Gripz have been tested and tweaked over and over until they were perfect for maximum effectiveness, usability, durability and safety. When you open the box you might be quite amazed by the quality, weight and strength of Fat Gripz. When you receive your pair, you'll see what we mean!